Santa Monica is a total tourist trap, but a beautiful one! We arrived on Labor Day and the place was packed. I took some pretty amazing photos (stayed tuned). I feel like the restaurant experiences on the beach were much better and less hit or miss. There was still a lot of “mall” food options (Yuck!). If you are in Santa Monica, there are a few places you should try to hit! Father’s Office We went here because we are Top Chef groupies and I’m not ashamed to admit it! The restaurant in Santa Monica opened at 5 and we got there at 5:15. It was almost half empty but not for long. Soon it was full and there was a line snaking through the restaurant to the door. Michael got the burger. I had a bite and it was…good…but odd. 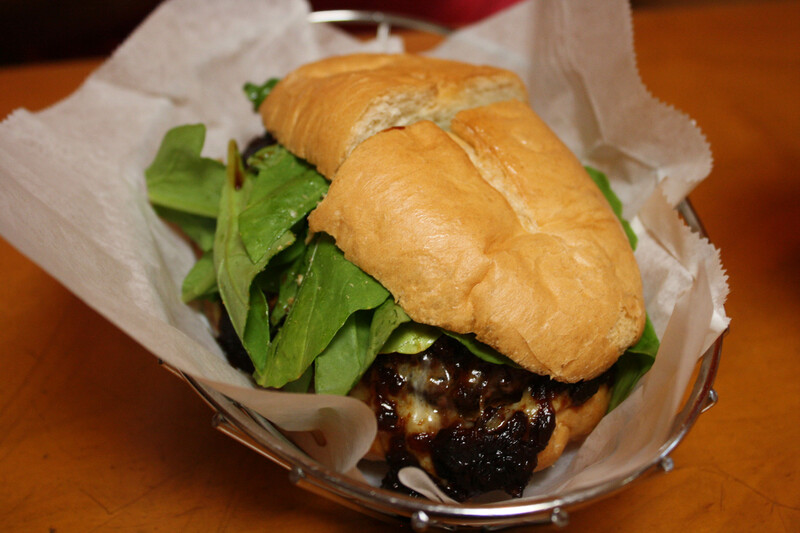 I think there were caramelized onions or some kind of jam on it that made the burger sweet. It had bleu cheese and spinach on it. I thought it was delicious, but would have been really rich had I ate the whole thing. 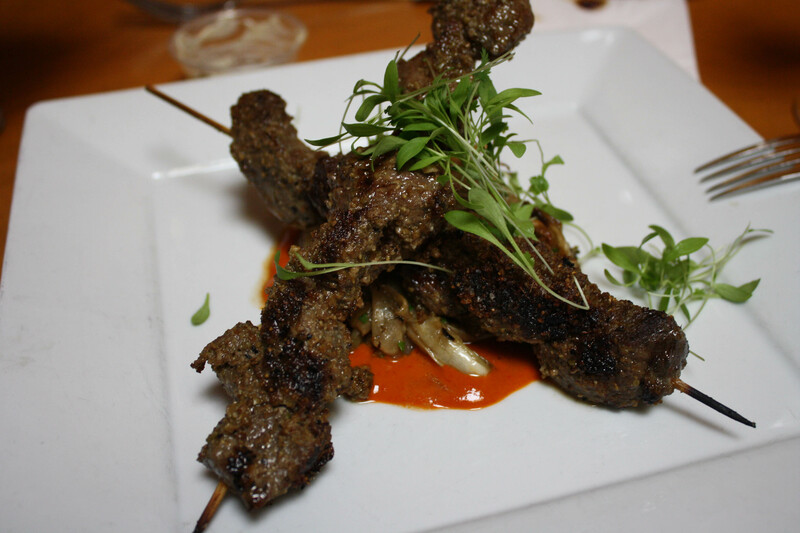 I got the lamb skewers that had daikon, grilled fennel and onions and sprouts. There was a red sauce that was faintly curry-like but not sure what it was. It was spicy. The lamb was perfectly cooked and crusted in pepper. I loved my dinner! I made a good choice. 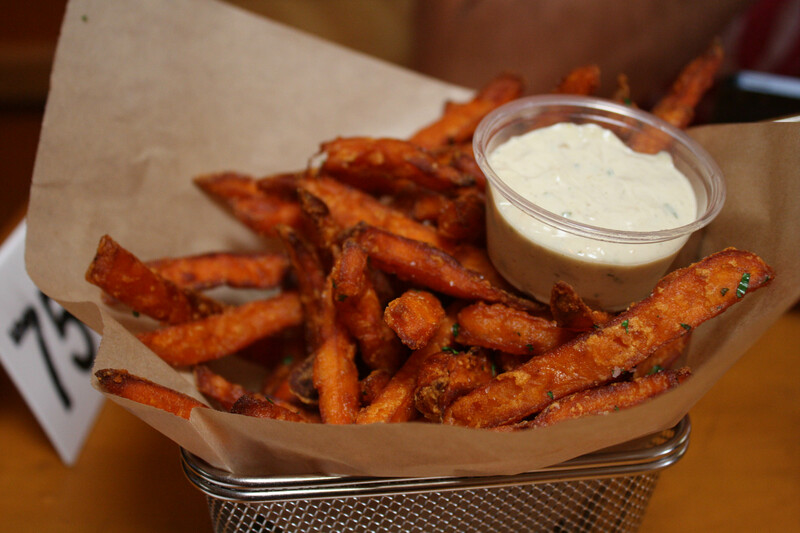 We shared an order of the sweet potato fries and they were hands down the best I’ve ever had. The garlic aioli sauce went perfectly. I would so totally go back to this restaurant! Sweet Rose Creamery Michael found this place from Yelp I believe. 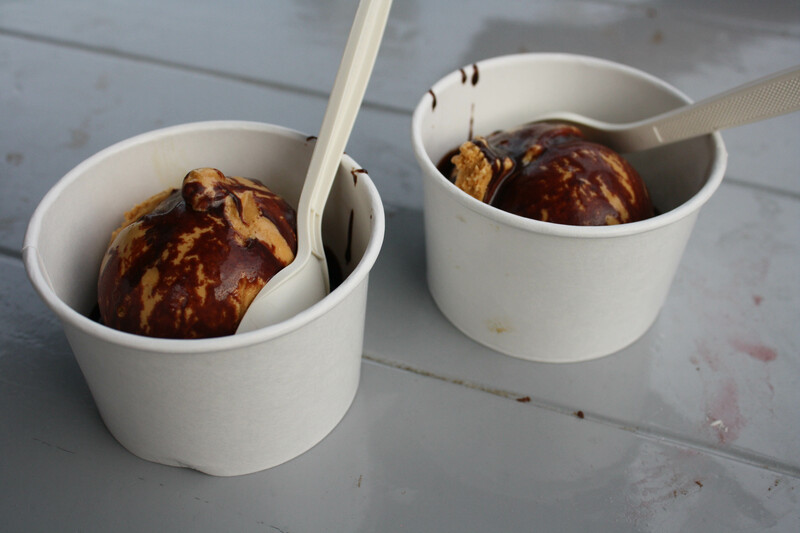 We wanted some ice cream and this place had so many reviews we had to try it. We had a hard time finding it and asked the valet guy who said “just turn the corner and look for the long line.” Apparently this place is popular! It’s located in the Brentwood Country Market. We both ordered a scoop of the salted caramel with hot fudge. The ice cream was great, not the best I’ve ever had, but good. We ate outside on the patio. The ice cream was slightly more expensive than I’d normally pay but it was good. The first morning I woke up in Santa Monica I was dying to go for a run! 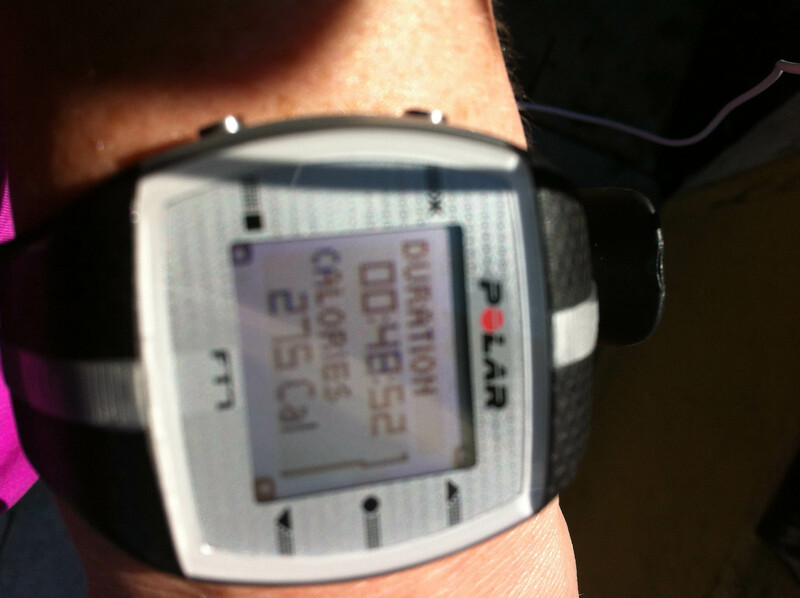 I laced up my shoes and walked down to the pier and then ran on the boardwalk trail along the beach. 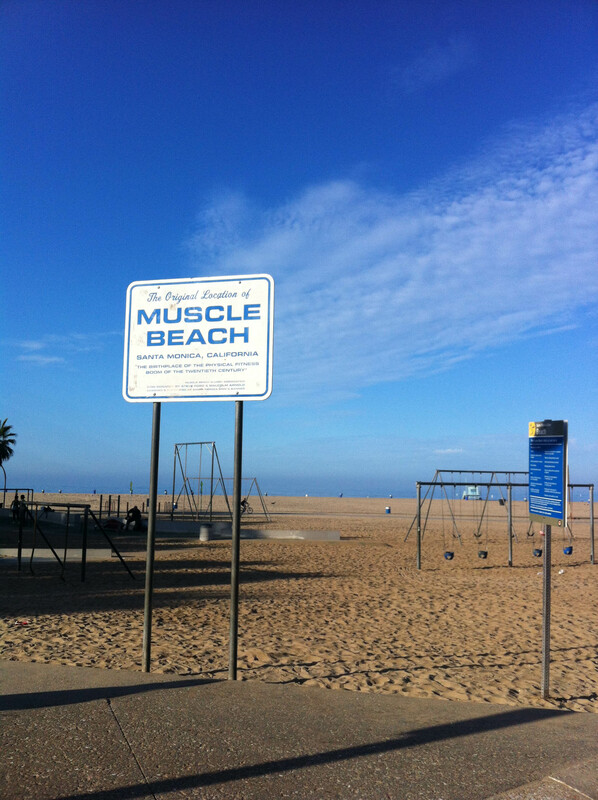 I passed Muscle Beach, which was almost empty (quite the difference from the first day I was there) and made it down about a mile and a half before turning around. 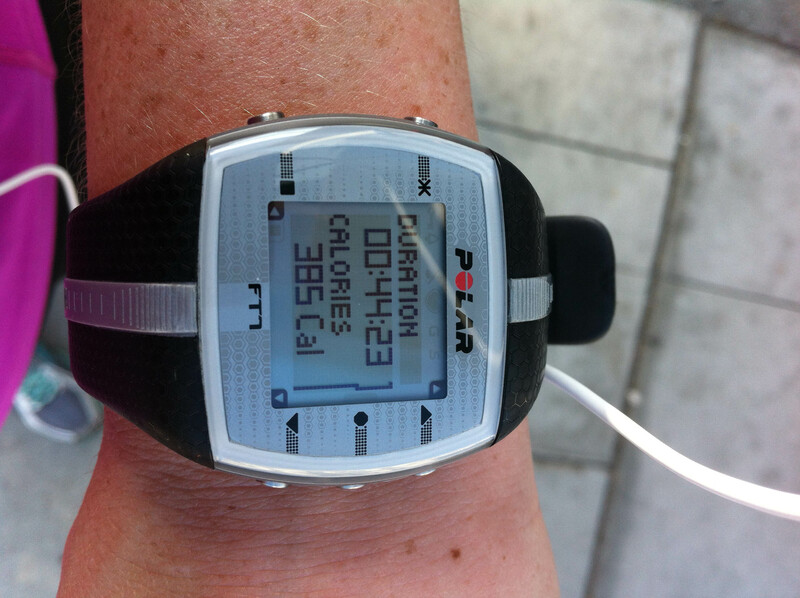 It had been a few weeks since I’d run (a knee flare-up sidelined me) and it was so good to be back at it! And with the beach as my companion, even better. I did just under 3 miles. On the day we were scheduled to leave, I decided to go to the nearby gym that I belong to. It was nice to find that option only two blocks from the hotel. Our hotel only had cardio equipment and with all the walking I’d been doing, I was good with cardio! I wanted to lift some weights! It felt good to get in a weight session after almost a week off. It’s hard to feel “normal” when your routine is totally screwed up! Urth Caffe This place was recommended to me as a good breakfast spot. I wanted something lighter since we planned on eating at In-n-Out for lunch before flying home. 🙂 I got the yogurt bowl and it came with delicious granola and fresh fruit (California does fresh produce right!). The iced coffee I got was perfect and one of the best cups of coffee I’ve ever had. I wanted a second one it was that good! The yogurt was just okay. Ever since switching to Greek yogurt a few years ago I’m not a fan of traditional yogurt–it’s kind of thin and runny. The downside to this place: long lines, slow service and very very expensive. 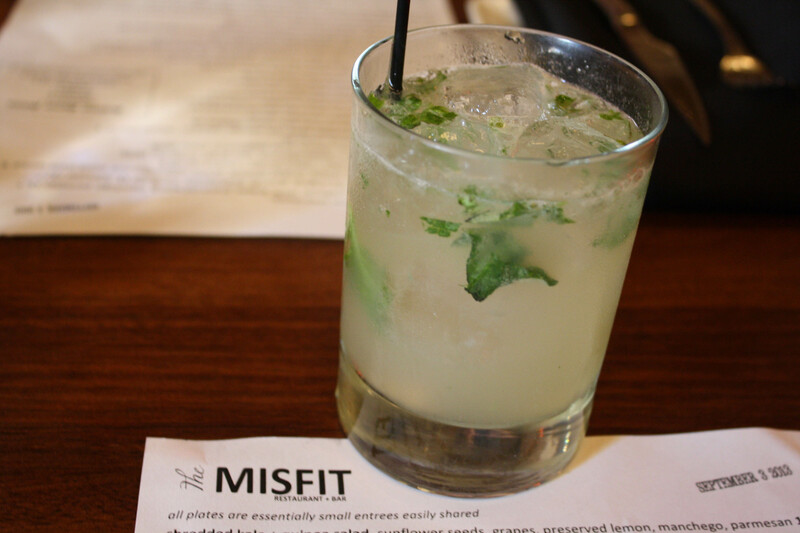 The Misfit Restaurant and Bar On the last night in Santa Monica, Michael and I walked a few blocks to this restaurant for dinner. We made it just in time to get a few happy hour drinks before they went full price. I got the vodka basil gimlet first and then the spiked lemonade next. Both were delicious and strong! For the food we shared three plates. 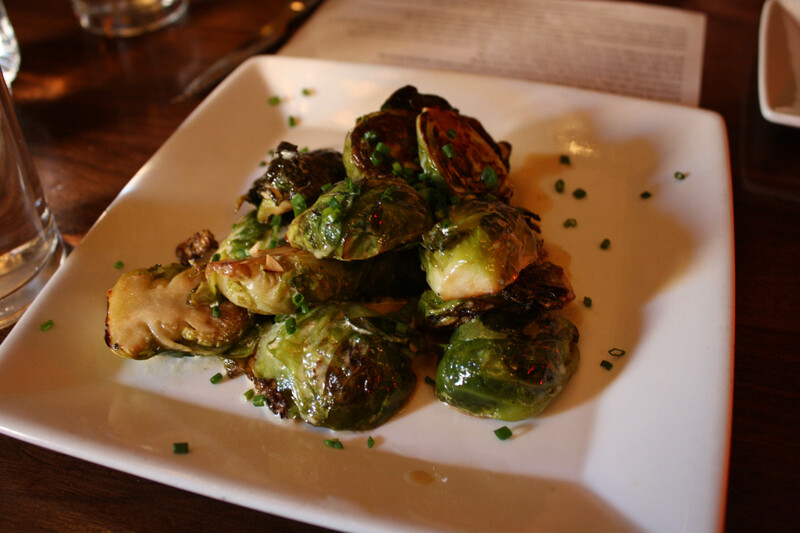 The first was the roasted Brussels Sprouts. All I wanted was some vegetables. After a week of eating less-than-healthy food, I wanted some greens. They were perfect. 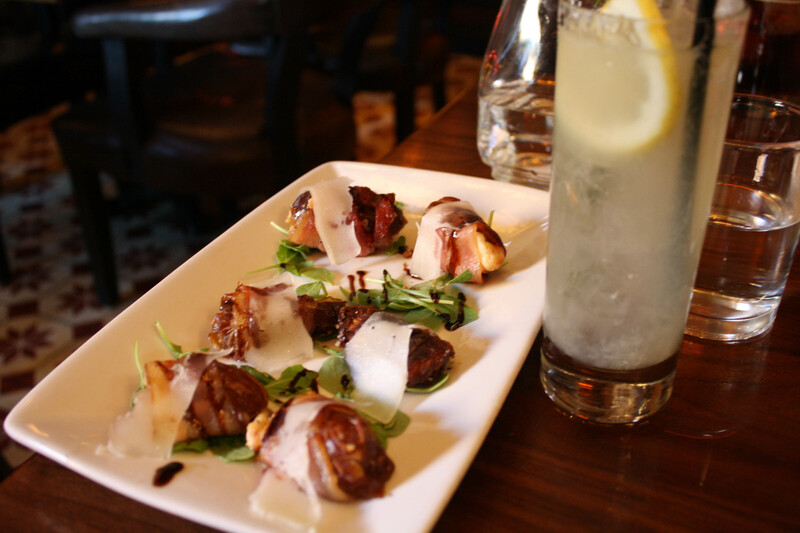 Next was the bacon wrapped dates that were then wrapped with goat cheese. These were fantastic but so rich! Sharing a plate of 6 of those were a little too much for me. I think 2 each would have been better! 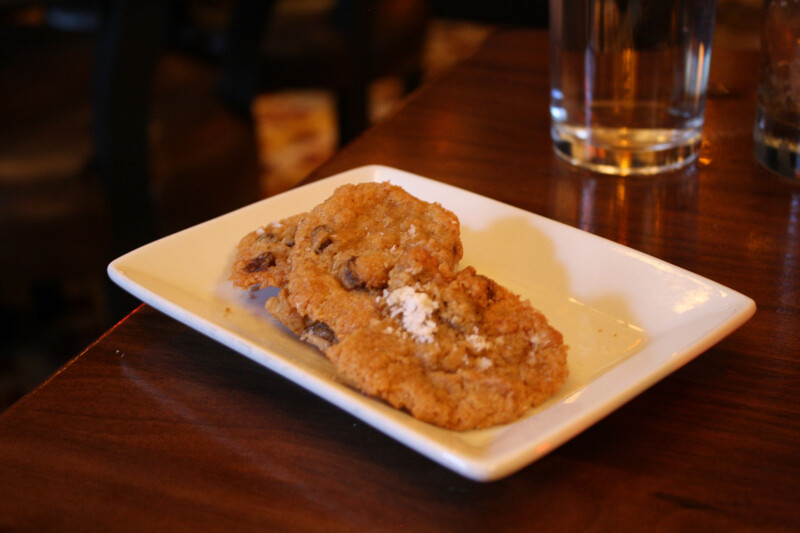 Before we could leave, they brought us a complimentary plate of freshly baked chocolate chip cookies that were lightly salted. Poke Poke This was on my “must do” list for Venice Beach. Da Poke Shack in Kona was some of the best food I’ve ever eaten and I wanted poke again! It was hard to find this place but eventually we did. It was more expensive than the poke we got in Hawaii, too. $11 got you a “big” serving of the fish and rice. The small portions were very small. 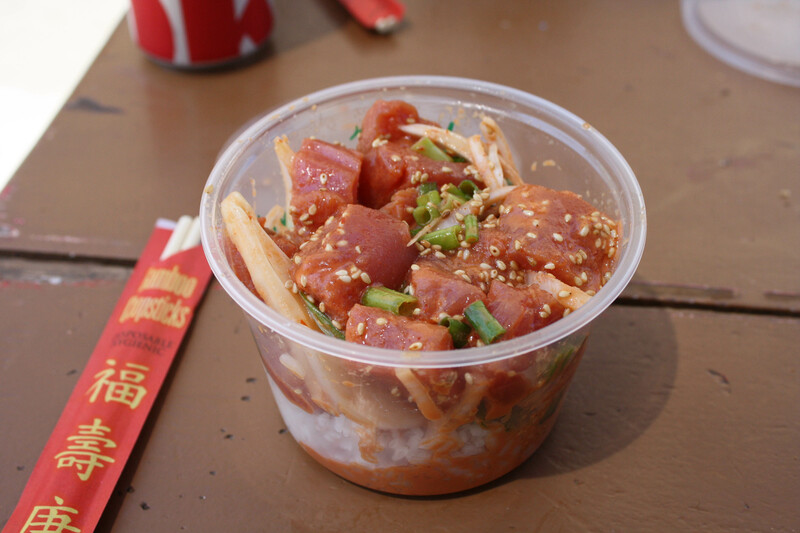 The window for Poke-Poke is right on the boardwalk in Venice. The food was fantastic. I got the spicy tuna and it was SPICY. Holy moly! 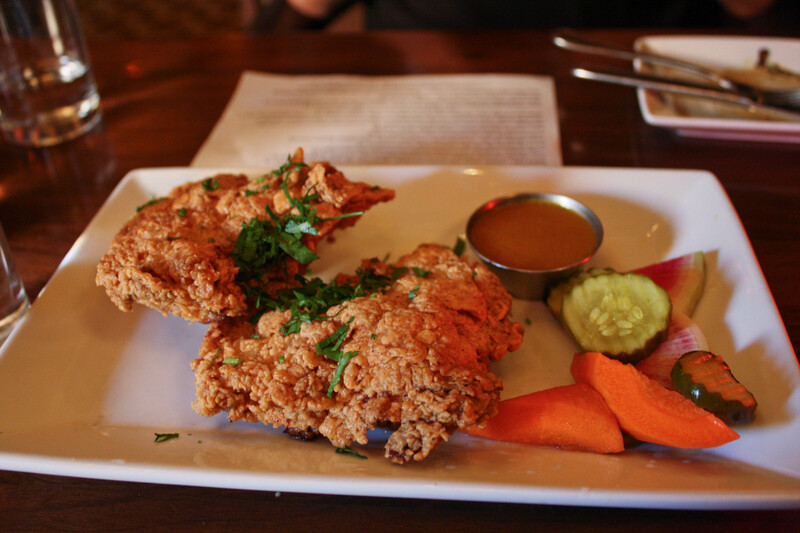 So glad we got a chance to try this place before leaving town. Dogtown Coffee Our first day in Santa Monica brought us some sunshine, a cool breeze from the ocean and a very hungry Lisa. I’d gone for a run along the water and was ready to devour everything! 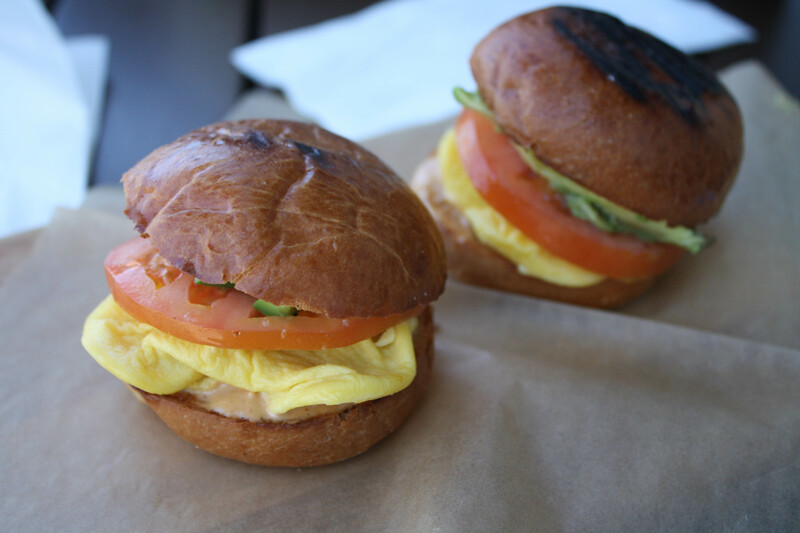 I got two of their “sliders”–they had scrambled eggs, tomato, avocado and aioli sauce on it. They look huge but they were really small; the perfect size, actually. The poke looks and sounds fantastic!!! It was! I love poke and if I see it on a menu I have to get it. I need to get there…it’s so flipping close to me now!! Oh yeah! You are so close! I don’t know whats more beautiful – the beach or pictures of the food. Such a beautiful place, I would love to go jogging down the beach it looks so peaceful. Never had salted cookies before, at least not that I remember. Sounds interesting, would love to go to some of these places. Thank you Alicia! California was gorgeous. Next time I’d spend more time at the beach!